Pilgrimage to Montana | Watts Up With That? Now that Arctic ice area is normal, Antarctic ice area is normal, sea level rise is failing to accelerate, temperatures are below all of Hansen’s scenarios, and the IPCC has proven itself to be untrustworthy – where can the CAGW religion go? Simple … Montana! According to Dan Fagre if the melting continues at its present rate then towards the end of another decade therewould be no more glaciers left in the Glacier Park. 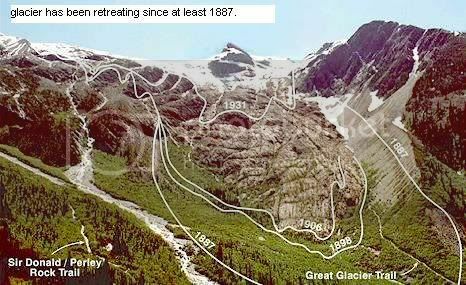 The glaciers of the park have been melting since 1850. The Glacier National Park at the beginning boasted of 150 glaciers of which 37 glaciers were eventually named. You can’t currently get into much of Glacier National Park because there is too much snow, but if you could you would see something like this. The history of glaciation within current Glacier National Park boundaries spans centuries of glacial growth and recession, carving the features we see today. These modest glaciers varied in size, tracking climatic changes, but did not grow to their Holocene maximum size until the end of the Little Ice Age (LIA) around A.D. 1850. While they may not have formed in their entirety during the LIA, their maximum perimeters can be documented through mapping of lateral and terminal moraines. Climate reconstructions representative of the Glacier National Park region extend back multiple centuries and show numerous long-duration drought and wet periods that influenced the mass balance of glaciers (Pederson et al. 2004). Of particular note was an 80-year period (~1770-1840) of cool, wet summers and above-average winter snowfall that led to a rapid growth of glaciers just prior to the end of the LIA. Thus, in the context of the entire Holocene, the size of glaciers at the end of the LIA was an anomaly of sorts. In fact, the large extent of ice coverage removed most of the evidence of earlier glacier positions by overriding terminal and lateral moraines. The current glaciers started to recede long before the invention of the SUV. Tree-ring based climate records and historic photographs indicate the initiation of frontal recession and ice mass thinning between A.D. 1860 and 1880. “Dramatic recession” occurred between 1917 and 1941. This was before the invention of the Hummer and the Soccer Mom. Hansen wasn’t even born yet. The coupling of hot, dry summers with substantial decreases in winter snowpack (~30% of normal) produced dramatic recession rates as high as 100 m/yr from A.D. 1917-1941 (Pederson et al. 2004). These multidecadal episodes have substantially impacted the mass balance of glaciers since A.D. 1900. Summer temperatures in Montana have not changed for over the past 80 years. Summer is when the snow melts. Winter precipitation has not changed in Montana since 1930. Winter is when the snow falls. Conclusion: there is little if any evidence tying the changes in Montana glaciers to CO2. Glaciers were a mile deep there during the last ice age, and have been receding and growing in cycles ever since. They may have been completely gone after the MWP and reformed during the LIA. Once again, climate alarmists have chosen a flawed poster child. This pattern is similar to what was seen at Glacier Bay, Alaska, where most of the glacial melt occurred between 1850 and 1900. 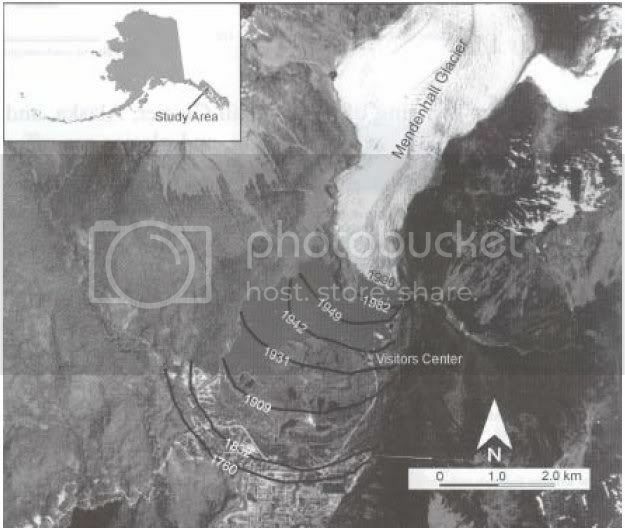 USGS map of glacial retreat at Glacier Bay. Montana is the location of the latest CAGW pilgrimage, after Copenhagen got snowed out. Where next? April 12, 2010 in Glaciers. Heretic! How could you compare ice melt to the actual temperature instead of the temperature anomaly! The fun will start if the glaciers start growing again, then there will be nowhere to run. What about the Tahiti Glaciers, they must have melted due to Doom. Thanks, Steven, for another insightful post. The graphs are an excellent illustration of why averaging climate parameters has no meaning. The reality is that we only experience weather in the current moment in time and climate is just a poorly understood abstract history of past weather events. Because of deterministic chaos, the future is just prophecy. I was reading a particularly vicious bit of the: “only holocaust deniers wouldn’t believe us” in the Australian press, when it occurred to me that this is really that last desparate attemps to string together an argument by the climate forecasters |(who can’t forecast the climate). When you can argue the evidence … produce the evidence, if however you don’t have the evidence, … resort to appeals to scientific authority as the “experts”, and when the public realise through climategate that these people have no scientific credibility … call us holocaust deniers and hope the dirt sticks! Personally, I’m happy sticking to the simple test: “show me the evidence that tells me it isn’t just noise” — and if they can’t even put up the evidence to pass this most simple test, why on earth should I waste any time trying to follow their twisted logic. Yes, the glaciers are all melting because the British papers tell me so. Governor Cesar Alvarez blamed “global warming” and said all the glaciers will be gone in 20 years if measures are not taken “to tackle climate change”. I am getting the impression that there are a lot of very slow and maybe somewhat dumb learners out there in the climate warmista pool. More and more of the most stupid and easily disproven but most profound sounding supposedly climate research based alarmist proclamations from small time “climate experts” are being knocked over like nine pins in the various high profile skeptic climate blogs. The blogs are just using original and historical data to throw cold water on those alarmist statements, original and historical data which should also be readily available those same “climate experts and scientists” if they really wanted to check the veracity of their profound sounding statements on future climate related disasters in the making. A lot of “grant deliverers” are in all likelihood starting to either read a lot of the more high profile blogs like WUWT and others or at the very least some of their minions most certainly are and are passing the news on around the coffee table or the water cooler. And some of the more outrageous statements and who their originators were will be remembered and documented for perusal far into the future. The climate warmista tide is turning and is just starting it’s ebbflow and all the little warmista climate researcher fish with all their profound statements on the oncoming climate disasters which from their small pool, could not be seen to be of a different type to that they actually thought it would be, will be left stranded high and dry and slowly gasping to financial death for the lack of grant funds as the climate warmista tide slowly ebbs. The big fish in the climate alarmist pool can get away with this for quite some time into the future but the small fry “expert climate researchers” are going to find in the years ahead that what they thought was good personal publicity at the time using grant grabbing climate alarmist statements will come back to haunt and perhaps destroy their careers in ways that they never dreamed of when they first made those statements. But then some people never will learn! Incontrovertible proof that the glaciers are composed of flippy-floppy ice. c) even if global warming is eventually going to increase, that it’s more bad than good for this planet, up to a point over the next couple of centuries, by which time we would have either destroyed ourselves, an asteroid has destroyed us, or we have grown up and advanced in technology enough to solve the climate problem, if indeed it’s real. Thank you for this. Glacier National Park is one of my favorite places on this earth, and it irks me to no end to see it constantly used as a “well, what about…” come-back line on some warmist’s laundry list. My response is typically grumpy: if you haven’t watched grizzly bears through your tent flap at 5 a.m. checking out your campsite, or stepped aside on a steep mountain trail to avoid bumping into a not-scared-of-humans mountain goat, then you don’t get to talk to me about Glacier. The next decade will prove things one way or the other for a lot of the theories. Warming has to resume in earnest soon and the Arctic has to be ice free in the next decade. If not, its a cycle. Himalayans: melting since 1850, everything is fine. is interesting in that it quotes that only at most 20% of water resource in India comes from melting glaciers, in contradiction to the scare “no more drinking water” stories the IPCC etc feeds us. Kate , Im sure you meant to be sarcastic, as a proof that people read newspapers and use it as proof of a trend supporting AGW theory? Or? we all have to be careful we don’t get misled by “vodoo science”. I live in Montana and looked into this issue once before. There was a study done on the Glaciers in Glacier National Park done back in the 1980’s before the global warming hype. His bottom line was that he felt that the glaciers were advancing and receding with the AMO cycle. I was curious about the 1850 date that is always used. Moon Lake, ND has an excellent precipitation proxy going back 1500 years. 1800 to 1860 was the most wet period in the whole history. I think this explains why the glaciers have been receding since 1850. Why don’t “they” know that? I’m more than a little familiar with Glacier Park as my family has lived in the area since 1886. While there may have been a respite from the glaciers melting during the LIA, in actuality the glaciers have been melting for over 10,000 years. 10,000 years ago the area was under several thousand feet of ice. It was the weight and the movement of this ice that carved out what is now the Flathead Valley and Flathead Lake. What we are seeing now is the end of that multi-century process. Fun facts, 3 or 4 years ago the Going-To-Sun road that crosses Glacier Park did not open till late June due to snow. 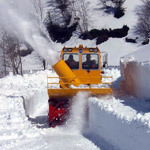 Each year it takes weeks to clear the road of snow and requires the use of surveyors to find the road each spring. If you ever have the opportunity in your lifetime, drive the going to Sun-To-The Sun road through the park. It’s one of the most beautiful drives in America. Of course most of the change did happen because the change in temperature and precipitation at the end of the LIA, we are still warming up from that event. Glaciers have retreated, but that does not mean that IPCC doom projections and IPCC models are right. In fact glacier behaviour is extremely different from one place to another, and in many cases precipitation change has been more important that temperature change. That is why no climate model would be able to simulate glacier response. Yeah, top tune by the Clash but what does he say right at the end just as it fades out? Never worked it out…. If all the glaciers are gone within 20 years, won’t that be the end of Peruvian glacier collapses? Wouldn’t that prevent anymore injuries from glacier collapses? On another note, remember the big Yellowstone fires a few years back? Some said that was the end of the beauty of Yellowstone. My wife and I took a back country hike into Heart Lake. Guess what, the trees are coming back and the animals are thriving. I guess forests go through cycles as well. We just don’t live long enough to realize what we see today is a snap shot in time and all the world is in transition. Glaciers do not “detach and fall” because of warming, they shrink and retreat. In fact, falling seracs (large blocks of glacier ice) are many times a sign of advancing glaciers. In any case there are very little information about the event to be able to judge it. Might be, but have they taken into consideration changes in land use, irrigation, hydropower plants, etc. I would bet they haven’t. Besides, measuring water flow is not an easy task, and Peru is not a model of river instrumentation. Here is a 2006 study by Pederson and others of drought variability in Glacier NP and other Rocky Mt. areas, for the recent few hundred years. Of course, this must be due to ACC, or “climate chaos” or perhaps “global weirding”. Some have even been growing for decades, and one, on Mt. St. Helens is brand new. This is very inconvenient to the kool-aid drinkers. I suspect that what is happening is that overall, the glaciers have stabilized, similar to the way the polar icecaps have. Ah, the land of frozen. The 76-77 drought bypassed it, according to a National Geographic article. 30 days has April, June, September and Montana. Which is always cold, except in Summer, which is almost never. When you don’t have the facts to support your storyline, you just make sh*t up. The most recent maximum glacier area in the park around 1850 matches the end of the LIA. Very reasonable to notice glaciers getting smaller since then. AGW propaganda again. The linked article is pretty lame, Thaindian News is sadly pretty much MSM light, the article laments Global Warming and the passing of the glaciers, and doesn’t even mention CO2. On the brighter side, comments on the article are predominantly skeptical, but their tone suggests most readers are woefully uninformed. Steve, please check your material, snowfall in the Rocky Mountains is measured in many feet per year, but the graph’s Y-axis suggests average yearly? snowfall is only 2-3 inches. Even on the dry plains of Montana east of Glacier Park, that seems sparse. I drove through Glacier National Park in June of 1999 and it was beautiful, in spite of poor weather. Even in June, at one point the road had walls of snow on both sides at least ten feet high. There’s been 11 more years of global warming since then – they must be getting ready to turn the place into a banana plantation. If you ever have the opportunity in your lifetime, drive the Going-to-The-Sun road through the park. It’s one of the most beautiful drives in America. In 1974 I went on a 2700 mile bicycle ride from Palo Alto to Billings MT. The original plan was to ride to my parent’s home in Northeast Ohio, but I decided to stay in the mountains instead. That year the Park service decided that cars and vans and whatnot made the Going-to-The-Sun made for dangerous conditions for bicyclists, and instead of banning motor vehicles (or making the road one way) they’d just ban bicycles. When I got there the hue and cry had been great enough to rescind that and implement an open-in-the-AM plan, but for some reason they wouldn’t implement that for a couple more weeks and I didn’t have time to wait. So I wound up hitching a ride over in the back of a pickup truck driven by a drunk Indian. It wasn’t until days later that I realized that in addition to missing some good photos, I lost one or two thousand feet of altitude that I was looking forward to riding down. I also need to do the Jasper-Banff ride someday. The ride from Lake Louise down to Banff was so fast that I don’t feel a need to do that leg uphill. Dave (04:42:40) : I’ve driven that road at from St. Mary’s west. At the western end is Lake McDonald which is a 400+ ft deep glacial lake. I find it fasinating the a glacial lake exits in Glacier National Park yet people are not able to connect the dots that the only way these lakes exist is that glaciers melt over time when ice ages end. Further, very few of the mountains in the park are over 10000 ft. so the there is no freeze line to stop the recession of the glacier. Natural events are not evidence of CO2 warming. The scientist in the park sevice or the USGS shoul be taken to task for not being forthright about this. Written in 1980 at the height of the ‘ice age is coming’ hysteria – I bet it’s been puzzling schoolchildren for years why it doesn’t say ‘warmer’, as taught by their teachers. Let’s hope you all are right about the tide of AGW support turning. Certainly, alarmist stuff like this does allow the sillyness to be pointed out, but any just read the alarmist stuff in the MSM. Regret that I see no signs of the AGW therefore tax/trade/control/make money brigade faltering or slowing down… certainly not in the UK, where legislation is now coming into effect stage by stage. My hope is that China, India etc will not cooperate with UN attempts, that smaller third world countries will continue bickering and posturing, so that the mounting evidence against significant AGW via CO2 will have time to be noticed. So, thank you Steve for the article, and all keep shouting “its a scam” as much as you can. Glacier retreat since 1850, It appears the majority of the Illecillewaet Glacier had retreated by the year 1931. I live near the north end of the Front Range in Colorado. Ten years ago, it looked like global warming was taking over (fooled me for sure.) The last few years we have been begging for some global warming. Climate in the west is very variable and always has been. There aren’t many Anasazi living at Chaco Canyon any more. Great, AGW-shrinking post, Steven Goddard. When all they have left is Montana glaciers, they definitely are spinning on thin ice. Plus WUWT knowledgeable commenters have provided enough research links to put the entire matter to rest. What!?! We must consider the entire Holocene in order to know very much about current global warming and cooling and about glacier advance and retreat? Why, our brains will calve off into the warming sea of data and our grant-glaciers will completely collapse! Please let Earth continue to warm, but let’s freeze out these “utter nincompoops” http://www.wisegeek.com/what-is-a-nincompoop.htm. It appears the majority of Glacier Illecillewaet had retreated by 1931. Gores Fairytail would have you believe the retreated started in 1980, photo below taken from Gores film. The claim: “Summer temperatures in Montana have not changed for over the past 80 years” is disingenuous. Firstly, the trend line over these 80 years, not shown, is +0.03F per decade. Not very large, but positive. Secondly, why choose to show 80 years? The straw man claim you’re attacking is about 150 years. The data series goes back to 1895. The trend from 1895 to 2010 is a significant one, +0.10F/decade. In fact, the trend from just about any chosen starting date APART FROM 1930 is significantly positive. What is the point of this sort of disingenuous analysis? Can even the most firmly convinced “skeptic” not see that this data has been cherry picked and the analysis presented is bogus? In some ways Glacier should be better kept as a secret. At what point do we have too many leftist extremists leave their computer monitors located in basement bunkers and ride up there to mess with nature? For folks like myself that practice conservation, Glacier, Denali, Wrangle Elias and the Lake Louise/Banff Rockies are required field trips. I rode my mountain bike before sunrise today and as usual, didn’t see another bike out. If we say too much about Glacier, GE (ZGubment electric) will pack up some more kids on spin junkets and give us reports of great alarm and fear. 2) The amount of greenhouse gas in the atmosphere has increased in the last century. 4) Therefore the glacier melt must be due to AGW. End of story. Go home. Don’t think about it anymore. Who needs evidence when we can employ logic like this? Sam Neill’s defecting Russian character in The Hunt For Red October wished (unsuccesfully) to see Montana before he died. I can see why. What a tragedy (I muse from Down Under) that such beautiful places are being processed into propaganda for pseudo-scientific panics, to be sent around the world like the latest vulgar rumours about Hollywood celebrities. I watched some of the season’s highlights shows for “Deadliest Catch” over the weekend. Anyone who watches those boats fighting their way through ice-clogged waters of the Bering Sea knows the “Arctic ice is MELTING!!! !” hysteria for what it is. More global warming headed for Montana tomorrow. Note snow forecast over large areas of western U.S. It was precipitating white stuff. Also note the ”heavy snow likely” and ”possible” over several 100 miles of the Sierra Nevada. . . . They may have been completely gone after the MWP and reformed during the LIA. It’s 50 thousand square kilometers below normal (as of today – 13/04/2010). It’s 90 thousand square kilometers below normal (as of today – 13/04/2010). No time frame given. It’s accelerated over the last 170 years, particularly in the last 50. I don’t think that’s true for the C scenario. In any case, temps are within the AR4 range of models run from 1990. Breaking news: The global temperature, which allegedly started cooling in 2002, starting warming again from 2006. From 2008 it warmed even more dramatically. I grew up 50 miles to the east of GNP. Every spring they begin plowing the Going to The Sun highway. Nothing new here… even in drought, warm years. I find this post misleading in many ways. Not the least, of which, is the plowing of wind drift snow. This year the snowpack across Montana is anywhere from 50-70% of normal. Not good! The pine beetles are killing even greater swaths of trees that are unable to produce sufficient sap to keep them out. Not good! I ran the chart maker and came up with a different result. Both the “actual” and “trend” are down. “Summer temperatures in Montana have not changed for over the past 80 years.” Again, when I ran the temperature for both summer and winter, the trend was up. To me winter temperature is more important than summer to track when it comes to glaciers. In this video Joe Bastardi talks about glaciers advancing. He is debating a woman who is a member of The Union of Concerned Scientists. Don’t let that title fool you. The Union of Concerned Scientists is not all scientists. It is an environmental organization. And not all members are scientists. The woman he is debating apparently is. Their debate is in the last four minutes of the ten minute video. What was Arctic and Antarctic ice like during the Medieval Warm Period? What were sea levels like then? So the trend from 1930 to 2010 is small. The trend from 1895 to 2010 is apparently three times as large. So a large increase in temperature trend due to warming from 1895 to 1930 is PROOF of ‘global climate change chaos’? How many SUVs were there in 1930? The storm track earlier in the winter was south. New Mexico and Arizona have up to 1000% of normal snow pack. Montana is forecast to get up to 600% of normal precipitation over the next two weeks, as the storm track has moved north. What do you think that will do to the snow pack? One theory about ice ages is that they are caused by warm winters and cool summers. Did you live in Montana between 1917 and 1941? Those mountains look like a great place for wind turbines…..
Arctic ice area is above normal. 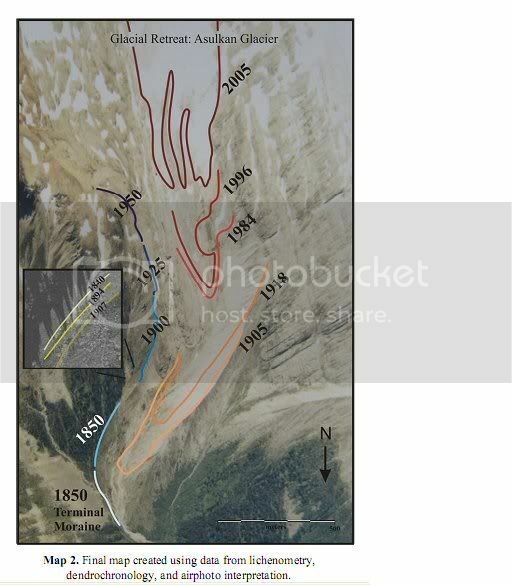 I have traveled to GNP many times starting in the ’50’s when Grinnell was 200 ft thicker than it is today. The last walk up there I took was guided by a park ranger who taught winters in NH and worked summers in GNP. In her explanation she told us that the Glaciers had likely melted completely 9 thousand years ago and varied over the interglacial period. She also told us that the park was not originally named Glacier because of presence of glaciers but rather because the glaciers had carved the distinctive circs out of the moutains. Those beautifully horned peaks and walls carved so thin that in places there are holes that you see light shine through after sunset brought the travellers and conservationists. There are many references to AGW around the park, but our Park Ranger guide was pleasantly knowledgeable and objective about it. GISS is below scenario C, but even so – scenario C isn’t relevant. CO2 emissions have increased at the high end. We should be looking at scenario A or B, not C.
The latest two to fall below the 25 acre threshold were Miche Wabun and Shepard. Each had shrunk by roughly 55 percent since the mid-1960s. 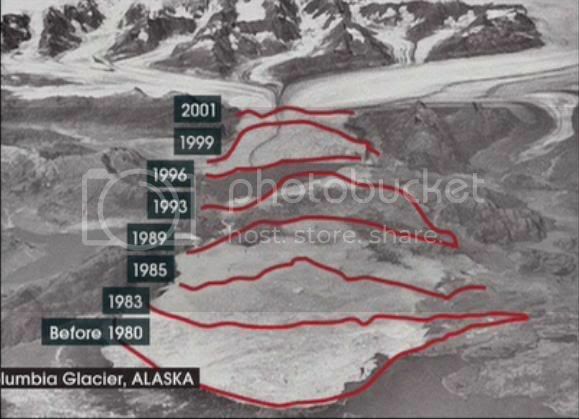 50 years ago, those glaciers covered a whopping 40 acres… Now they cover just under 25 acres. 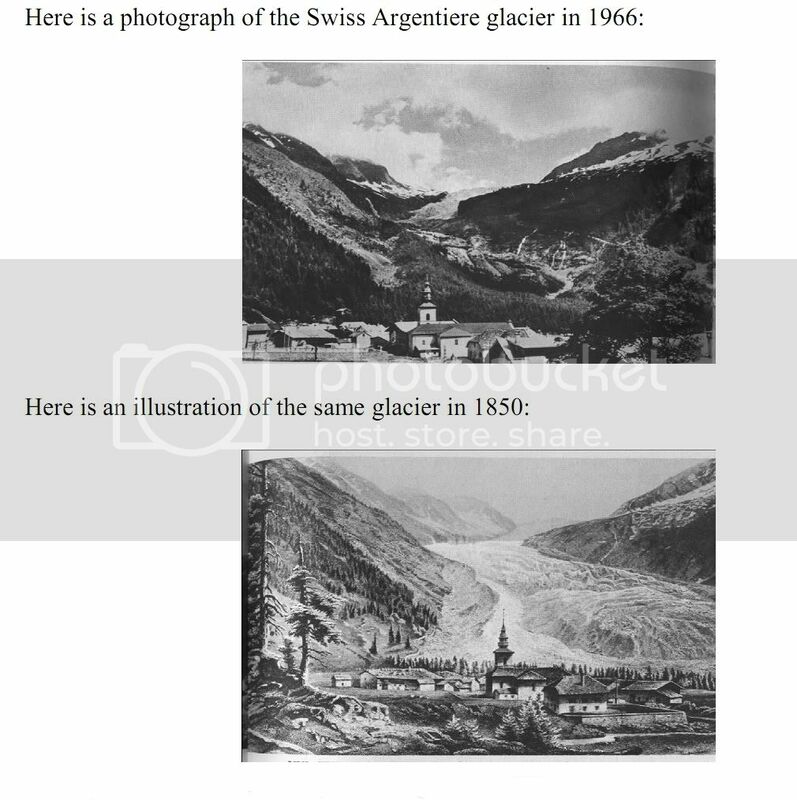 25.01 acres is a glacier… 24.99 acres is an ice field. “They’ve been on this landscape continually for 7,000 years, and we’re looking at them disappear in a couple of decades,” he said. The alignment of decadal-scale climate anomalies over the early 20th century produced a period of glacial recession somewhat analogous to conditions experienced over the past few decades. The coupling of hot, dry summers with substantial decreases in winter snowpack (~30% of normal) produced dramatic recession rates as high as 100 m/yr from A.D. 1917-1941 (Pederson et al. 2004). These multidecadal episodes have substantially impacted the mass balance of glaciers since A.D. 1900. Had the ecologist been around in 1941, he would have been Chicken Little-ing just as much as he is now. One can only imagine the ecological Chicken Little-ing that would have occurred when the href =http://www.museum.state.il.us/exhibits/ice_ages/images/loopglac.gif> Pleistocene ended. One can only imagine the ecological Chicken Little-ing that would have occurred when the Pleistocene ended. We’ll see. But that doesn’t rehabilitate your misrepresenting the facts about GNP and Montana. There is much fear by those that live by the water drawn from the Marias River and its tributaries are in for a severe struggle this summer. In an average year snow at this time would be from 120 to 130″. The view from the North Summit cam looks towards GNP. One can only imagine the [I]ecological Chicken Little-ing[/I] that would have occurred when the Pleistocene ended. A bit of a spring snow snit. Nothing new. Perhaps when the last GNP glacier goes, it could be renamed LIA NP in commemoration of the LIA glaciers that were once there? There is a Licken Chittle in evey pod. I grew up in Calgary, just a stone’s throw north of Montana. We have our own Glacier park (Columbia Icefields), in fact that is the direct source of our municipal water supply. I grew up in an environment of spur-of-the-moment weekend jaunts out to Banff and Lake Louise, and since my brother in law got his Piper Cherokee 20 years ago we occasionally fly over the icefields… which is often a bumpy flight. One of my favorite logical disconnects is the declaration made a few years back by some environmentalist. Here it is: the glaciers are melting. Our water comes directly from the glaciers. We should use less water. The really scary part of that is how many otherwise intelligent people I know that actually see nothing wrong with this logic. Anyway, in my 40+ years of regularly visiting the region I have seen nothing to indicate that anything is out of the ordinary except for the grotesque commercialization of the tiny little portion of the Rockies that is Banff. We get good years, we get bad years. 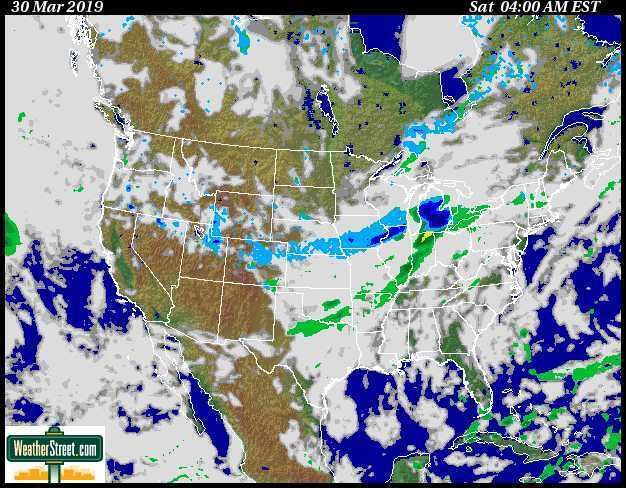 Every time there is less snowfall the ski resorts are all crying that they need federal money to stay in business because of “climate change”, every time there is more snowfall we have other groups screaming for money. One sad thing: if you wander around the icefields via Google Earth, almost every one of the glacier “popups” (which come directly from wikipedia) are lamenting the loss of these glaciers due to manmade global warming. It is the most pathetic, transparent, ignorant thing I see when panning around. In 1995, The Front Range of Colorado had very low snow pack at the end of March, and ended up with record high snow pack in June. Nobody is “misrepresenting” anything. Snow pack in Montana from 1917-1941 was often 30% of “normal.” Was that due to CO2? The ROOS graph you cited is dated 9th April. You made your post 12th April. The Cryosphere graph I linked is current. Your observation was already out of date by the time you posted. Arctic sea ice area is below normal. Check my link above. You’ve done something wrong with the overlay. 1976 shows up as about -0.23C on your graph. The actual GISS anomaly for 1976 is about -.17C: it’s warmer. There are discrepancies like that for other years, but that one is the easiest to see. Hansen ’88 ran with a climate sensitivity of 4C for a doubling of CO2. That has since been revised down by 25% to 3C. Hansen’s projections from 20 years ago are too high. It would be better to work with more recent models (like the AR4 ensemble from 1990) to see how obs compare to the state of the science. Now that Arctic ice area is normal? You should learn the difference between “normal” and “average”. “Normal” could be defined as (medium +/- 1 SD). That would mean e.g. that an IQ of 85 to 115 is “normal”. Excellent post. Amazing what one sees when the actual local temperatures and precipitation are looked at when something is blamed on global warming. Pederson et al came to the same conclusion that temperatures and ice melt of the past decade in GNP was not at all unusual. In fact the rates of glacier melt in GNP were higher 75 years ago than they were in the past decade. The scientific studies are out there. The Global Warming crowd just isn’t bothering to do a decent literature review. See:Pederson, G.T., S.T. Gray, D,B. Fagre, and L.J. Graumlich. 2006. Long-Duration Drought Variability and Impacts on Ecosystem Services: A Case Study from Glacier National Park, Montana. Earth Interactions, 10, Paper No. 4. Well Kate; you get in the way of one of those things, and you are going to get hurt. New Year, 2007, I was with my family at both the Fox, and Franz Josef glaciers in New Zealand. Their termini, come down pretty much to sea level, so you can drive to within quite close to the bottom, and there are signs showing how far down the valley they were in the 19th century. You can get down in the former path of the ice, and walk up to the end of what is there now. On the way, you pass many signs telling you to not go any further, because it is dangerous. You notice that there are huge blocks of broken ice strewn all the way down from the foot of the glacier, stretching from 1/4 to 1/2 a mile from the overhanging end face. Somehow, you get the idea, that when ice falls off the end, it doesn’t just go “thud”, but it bounces, and careens down the valley towards where all those Darwin awards candidates, are walking up along the stream. Well we went up there anyway, but first crossed the stream well short of the end of the ice capades, and got up high on the canyon side wall, where even bouncing ice wouldn’t get us. this let us get within a couple of hundred feet of the massively overhanging end face of the glacier; but well off to the side; protected by the rock walls. While taking photographs of the massive ice cliffs, we noticed, that there were sizeable ice caves in the very end of the ice face, some of them going in several hundred feet, into the cavernous mouth of the ice monster. The outer reaches of those caves were overhung by at least 100 feet, and in some places maybe 200 feet, so the inner reaches of those caves could be 4-500 feet from the top rim of the ice cliff. Well wouldn’t you know it; there were actually people way inside those caves; having their pictures taken by other idiots, who were standing under the overhanging cliffs. Well I was hopiing to get some footage of a big squish if one should happen; but sad to say. the ice was well behaved that day, and didn’t feel like stomping the tasty morsels thatw ere stuck in its throat. Buit I have never heard of a whole glacier collapsing, like happened in Peru. It would seem that ice is somewhat incompressible, and stuck between the rock walls, there doesn’t seem to be any way I can see, for it all of a sudden to go “splat”. But I’m sure that if it did, you could get hurt, especially if you are inside it when it does that. There is nothing wrong with my GISS overlay. The 1976 number you object to was from Hansen’s 1988 paper Fig.3, which is the bottom image in the overlay. Hansen has since adjusted the 1976 temperature upwards. The next time the ROOS Arctic area graph is updated, it will still be above normal. And the UIUC anomaly is on an upwards trend, almost at zero today. Whenever someone mentions Montana, I think about a particular movie . . .
Capt. Vasili Borodin: I will live in Montana. And I will marry a round American woman and raise rabbits, and she will cook them for me. And I will have a pickup truck… maybe even a “recreational vehicle.” And drive from state to state. Do they let you do that? Capt. Vasili Borodin: No papers? Captain Ramius: No papers, state to state. Capt. Vasili Borodin: Well then, in winter I will live in . . . Arizona. Actually, I think I will need two wives. Captain Ramius: Oh, at least. According to Wiki, Half Dome is supposed to have been formed much as we see it, and was not carved by a glacier as most believe. The placement of the face just above a glacier carved valley sure looks like short odds to me. Springtime precipitation in Montana has increased since the 190s. Well it’s nice to have Dr Hansen’s own values for the climate sensitivity. Going back to the Cambrian about 540 Mya there have been about 4 1/2 halvings of the atmospheric CO2, falling slowly over time from a high of about 7000 ppm, to the recent history low level of 280, when Earth’s temperature was about 14 degrees C.
So taking Hansen’s new and improved value of 3 deg C per doubling (or halving, that means that earth temperature must have fallen by 13 1/2 deg C sicne the Cambrian, so the temperature back then must have been 27.5 deg C.
Well unfortunately, that does not agree with the observations, that say that earth’s temperature back then was only 22 deg C or only 8 deg C above the recent era. So that puts a limit of 1.78 deg C for the climate sensitivity. Well funny thing is that the temperature was also 22 deg C just 65 Mya at the Tertiary/Cretaceous boundary, when CO2 was only 1000 ppm. And the last time that atmospheric CO2 was this low; during the late Carboniferous, and early Permian, the earth’s temperature got down to around 12.5 deg C, so it looks like we have a bit more cooling to do yet. barry, your criticisms of the details aside, I don’t see much to argue with Steve’s point that level of advance of the glaciers in 1850 was not typical and that much of its “recovery” from the Little Ice Age 1850 levels was naturally forced. That seems like the take home message here to me. Also people have looked at more recent projections (e.g., Lucia). Projections continue to remain high compared to the data. In 1983, Time Magazine was warning of a new Dustbowl in Montana. ROOS just updated their ice area graph to April 11. Still above normal. Really, barry, sea levels are rising? Darn, I can’t find any evidence of that. Got any before & after photos that prove sea levels are discernibly rising?? Putting words in someone’s mouth is the tactics of the left. Don’t do that. In the 60’s the front range of Montana was dotted with pothole ponds and sloughs. There was one slough that went from Shelby to Kevin. Most are gone. The people that have lived there for 50 years of more know this. No one year makes a trend. No one picture of GNP captures what is happening there. 1. “Summer temperatures in Montana have not changed for over the past 80 years. ” False. Further you fail to make the winter comparison. 2. “Winter precipitation has not changed in Montana since 1930.” False. 3. “You can’t currently get into much of Glacier National Park because there is too much snow…” Very misleading as they close the road for the winter every year. It is a very narrow dangerous road in the best of conditions. Don’t make stuff up to support a point. This isn’t about CO2. This is about correctly representing the facts. Climate change is real, we have never been in stasis. In my opinion, 90% is caused by natural variability factors, and 10% by animal and plant life. Out of that 10% I would assign 5% to humans. Out of that 5% I would attribute 2% to human caused GHG’s. That 2% doesn’t drive the climate supertanker…and the 5% can’t stop it. The ice area graphs in your document are not correct, because they don’t correct for the pole hole adjustment in 1987. I am pretending to believe all the “man-made global warming” articles, just like all our politicians and bureaucrats pretend to believe it, too. Further to my (10:37:25) comment there is this: http://nris.mt.gov/nrcs/Apr10/snowaterpt04_10.jpg A GNP snow blower picture doesn’t change this reality. I changed the color scheme in the GISS vs Hansen ABC plot to make it more clear. Current GISS is red, and Hansen’s 1988 predictions from fig. 3 (which include his 1988 GISS temperature data ) are in black. Summer temperatures in Montana are about the same as they were in the 1930s. Obviously they change quite a bit year over year, but there is no significant long term trend. Winter precipitation is similar, no significant long term trend since the 1930s. Spring precipitation has increased since the 1930s. Were you in Montana during the dry, hot period from 1917 to 1941? How would you have reacted to several decades of 30% snow pack? Here is an even longer non-trend : Montana summer temperatures from 1917, the date mentioned in the article. I went to a presentation about this and the park rep gave the scary story complete with some nice moving graphics of the shrinking glaciers and recovering vegetation (I still have my complimentary CD). But when I asked him about the Altithermal period he just said that their research didn’t go back that far. So all they are talking about – as many have already pointed out – is the waning of the Little Ice Age… shocking that glaciers would recede during such a period. Oh well. If you want to see some much, much worse junk science from Montana check out the ‘science’ behind and still driving the wolf introduction there! 2 + 2 = 5, and wolves no have impact on their prey populations. Honest! The 1976 number you object to was from Hansen’s 1988 paper Fig.3, which is the bottom image in the overlay. Ok, I see that now. Thanks for making the graph clearer. Still, you are comparing with a 20-year old projection that is too high as it is based on a higher climate sensitivity than figured today. I’m not sure of the utility here – except to say that Hansen ’88 projected too high. ROOS have udpated to 11th April. The anomaly is is still above the average but close to normal. But Cryosphere Today was current when you posted (12th), and anomaly is tracking below average. It’s odd you didn’t use the most up to date data when you posted about current conditions. However, as you must know, this is all a bit academic. Surely by now we must have learned that a few months or days (!) anomaly is meaningless in terms of climate trends. We could point to the UAH temperature of the last couple of months and conclude that the globe is severely warming, but I think we all know that that isn’t valid either WRT climate trends. We keep confusing weather with climate. The long-term (climatic) sea ice trend is distinctly downwards, whether we speak of extent, area or volume. In time the sea area anomaly will be below average again, but no one here will draw any conclusions from that. In the same way, ROOS sea ice extent, which was the talking point here a few days ago when it was normal, is now below normal. This subject will be dropped until some time in the future when stochastic variability sees it creep towards the average. It seems perfectly clear to me that weather anomalies are being cherry-picked to say something about climate. It’s a totally invalid operation whether the anomalies are up or down. Anomalies that superficially look like going along with global warming will be caveated with the entirely proper qualifier that its just weather, attributed to weather behaviour (AO, ENSO or whatever), and cooling anomalies will be treated as if they’re meaningful WRT climate. You can’t have it both ways. What would be good is WUWT establishing a statistically valid period for climatology (something like the 30 years per the WMO). Otherwise this obvious double standard will continue to sow confusion. Can you state once and for all what a climatically significant period is? And provide a statistical rationale for doing so? But if we’re going to talk about short-term phenomena as if its climatically significant, then the globe has been warming since 2006. Go ahead and run a regression on any of the global temp data sets. As long as there are no standards, we can say anything. Climate is cyclical. There is no particularly good reason to believe that a linear fit is meaningful for any extended length of time. The ROOS graph I linked is always their most current image. They don’t necessarily update it every day. Glaciers are highly precipitation dependent. Precipitation in snow. When it isn’t snowing, glaciers lose mass due to sublimation. When the losses due to sublimation are greater than precipitation, the glacier loses mass and retreats. When the recitation rate is higher than than the rate of loss due to sublimation, the glacier gains in mass and advances. Of course, at lower and warmer elevations, there is melt back at the tongue of the glacier, but the retreat of the tongue due to melting simply indicates that the rate of sublimation is equal to or greater than the rate of precipitation. Just my observation, I am not a glaciologist, but the chemistry seems clear enough to me. It also seems to me that the warmer the temperature of surface air over the surface of water where the H20 vapor that results in precipitation over the glacier comes from is, the greater the advance (or the less the retreat) of the glacier would be, as the warmer the winds evaporating the source of the precipitation are, the more H2O vapor would be entrained by those winds, and the greater the precipitation rate would be. Aye, nev’ buy a liver. Do the flat graphs at the top mean that Montana has had no UHI effect? A time map similar to the Alaska one would be useful for the Montana glaciers. I don’t suppose anyone knows where one might be lying around? Choose the “mean temperature” and the “summer” period. The green trend line for temperature tilts up. Chose the “annual” for both temperature and precipitation. The trend line for temperature tilts UP while the precipitation trend tilts DOWN. Please discuss these results in the context of your article claims. So Craig, what you are saying is that temperatures in Montana have increased since the end of the LIA? I’m very surprised to hear that. Summer temps in Montana have not increased in the last 95 years. They did increase prior to that, possibly due to all the horse drawn buggies emitting CO2. Before you know it they’ll hire you. Chose the summer mean temperature. The trend is up. What I’m saying is that I can read YOUR referenced chart even if you can’t. My comment at (14:26:36) seems to be stuck in moderation. The annual increase for the 7 stations since 1880 was 1.6F. Your answer is unresponsive to my request at (14:0513). BTW, when is Colorado considered Northern Rockies, as you claim??? Montana and Alberta is what I have always considered Northern Rockies. Colorado is way down in y’all land. The summer linear fit since 1913 is a burning hot 0.002 degrees per year, with an error about two orders of magnitude larger than the calculated trend. The trend line is meaningless. If it makes you feel better to think Montana was never warm or dry in the past, then more power too you. BTW – Winter Storm Warning for GNP through Wednesday. Here is streamflow data for the Yellowstone River. Note that essentially all melting occurs during the meteorological summer. June, July and August. You’re misrepresenting Steve’s claim, which was that Montana temps have not increased *since 1930*. There was an increase between 1895 and 1930, which yields a net increase of about 1.3F over the entire record. See also my links above for the 7 stations surrounding the park since 1950. As I commented above, the pothole ponds and sloughs of the 60’s that I have memories of have dried up. Some of those are where I hunted ducks and fished. They are now dirt. The precipitation trend line from your link supports that memory. The beetles are destroying large sections of the forest as the trees are unable to produce sufficient sap from many years of drought. You and I are probably in agreement on many things, but Montana is not one of them. See again my comment at (10:37:25) this morning. Go to thechart maker from Steve’s article link. The trend line is up from 1895. It continues up from 1930. That’s what the graph shows. Now, expand the look to annual rather than just summer. That white stuff isn’t snow. It’s dessicated polar bears. The fierce heat of the Arctic sun has reduced them to powder, and it has blown down into Montana. If you look at the graphs, there is no question that the 1960s was cooler and wetter than the present – as you recall. The 1960s were also cooler and wetter than the 1930s. The point of this article is long term glacial trends, not the 1960s weather which you remember so fondly. I have provided links to lots of NCDC graphs. What part of them is it that you don’t understand? There is no net summer warming over the last 95 years. That reminds me of Eskimos. I find you very disingenuous. Go back and read my comments from the beginning. I can’t make it any plainer for you… and I will not repeat myself further. I have updated the study of western Montana climate with information on mountain snowpack – strong correlation to the PDO. OK Craig, you win. Clearly the 60% of normal snowpack of April 10, 2010 is much smaller than the 30% snowpack of the 1917-1941 period. What was I thinking of? And the small glaciers of the 21st century are totally different from the small glaciers prior to the LIA. It is all due to CO2, and had we only passed Kyoto, those poor glaciers in Montana would still be happy and safe. Thanks for the overview. I had heard about the Little Ice Age, but didn’t know it lasted that far into the 19th century. Interesting. You continue to be disingenuous. Where did I blame C02 as you suggest? READ my supertanker remark in the (10:37:25) comment above. I wrote this article to show that it is ridiculous to blame the melting GNP glaciers on “global warming” i.e. CO2. It appears that we are in agreement about that issue. Climate is cyclical. Sometimes it is warm and dry, other times cold and wet. You grew up in Montana during one of the cold and wet times. had you grown up during the dust bowl, you would have a different view of the world. I went there Craig & yes someone’s playing fast & loose with trends & it ain’t Steve. For Data Type: chose Mean Temperature. For Period: chose Summer (Jun-Aug). Hit “submit.” Does the green temperature trend line slope up, down, or flat? Then do the same procedure for Annual. Does the green temperature trend line slope up, down, or flat? Now look at precipitation. For Data Type: chose Precipitation. For Period chose Winter (dec-Feb). Hit “submit.” Does the red precipitation like slope up, down, or flat? Then do the same procedure for Annual. Does the red precipitation line slope up, down, or flat? It is very well established that summer temperatures rose after the LIA. The graphs I referenced correspond to a different time period. Is that concept somehow confusing? I have read your comments and Steve’s replies, and I have looked at the sources — although not an exhaustive study. In your first post, I initially thought that you had some valid points, but as the discussion wore on, I have become quite bewildered by your accusations that article is misleading. To be sure, sometimes we would pick different starting points, but I have examined your ncdc link, and I do not see anything misrepresentative about what Steve has done. You claim an increasing green trend line for 1895 to 2009. Yes, it is there, but it is there basically because of the temperature increases that took place before 1920. This is not a discussion about what happened before 1920. From your link take the data from the whole of the 20th Century plus up to 2010. It avoids the cherry picking and hockey stick type distortions. Then evaluate the trend line from 1930 to the present for both temperature and precipitation. Zircon encrusted tweezers? Dental floss tycoons? The basic point is sound: Glacial advance at the end of the LIA was anomalous, and we’ve returned to a “more normal” condition. Secondly the positive trend in temperature has no statistical validity if it is not accompanied by an uncertainty. I’d be willing to bet the central value falls within the 95% confidence interval of the estimator (done correctly). Thanks you for your comments. Sometimes it becomes difficult to stay on topic when a determined poster starts leading the conversation down a rat hole. Nice work, Alan. I still think you should add a linear trend algorithm to your calculator, tho. Your climate app is about the best on the Net, but t’would be nice if it had that option. Also, Alan, the stations in the Glacier Park area seem not to have data later than 2005. What’s up with that? Sorry for the confusion. Leaving out the years before 1930 would be like leaving out the years before 1970. Run the graphs again for an annual period only using 1970 to the present. So the issue becomes what period to measure — 40 years, 80 years, or a 100+ years. Next, relate that data to manifestations of temperature and precipitation trends in Montana’s physical environment such as tree loss to beetle kill, stream flows, lake levels, water tables, frequency and severity of wildfires, etc. This is a story that can’t be summed up with a picture of a GNP snow blower. I didn’t realize that beetles affect glacial cycles. You seem to have an agenda which has nothing to do with this topic – whether or not recent glacial loss in Montana is due to CO2. You haven’t presented one shred of evidence to the contrary, and are just wasting everybody’s time. We all know that Montana warmed up in the decades following the end of the LIA. How many times and in how many ways are you going to repeat that fact? What is interesting is the fact that Montana summer temperatures are no higher than 60-95 years ago, despite large increases in CO2. Your failure to grasp the significance is very telling. I’ve run the temps for the period after 1950 (the reference date mentioned in the AP story) for the 7 stations surrounding the park. See the links above. Also see Alan Cheetham’s page (link above). Also, I included the start difference between 1995/1996 pair to show the huge difference that starting point can make for the newer viewers of this kind of data to show how easy it is to cherry pick. Despite the sample size of ~15 years, the slope changes from positive to negative (of nearly equal magnitude) just by changing the start date by a single year (and 1995/1996 only differed by 2 F). Starting in 1992 gives a slope ~6.5x bigger than starting in 1995, but starting in 1983 gives a slope ~4.2 smaller than starting in 1995…go figure. This just goes to show why statistical significance tests are important. Assuming this data has no uncertainty, I get the entire data set (1895-2009) to just BARELY squeak in as a significant slope (at 95% CI). But lets face it, each point has its own uncertainty that adds to this, making it insignificant. It is much easier to disprove the existence of a long term correlation than it is to prove one. This is “not* a long term warming trend. If someone wanted to prove a correlation between temperature and CO2, they would have to demonstrate that it works through all time periods. To argue against it, all I need to do is show that it doesn’t work through any (reasonable length) time period. I read somewhere that they consider a glacier to “exist” if it is more than 25 acres. I gather that one of the points of your paper, is that what they are talking about in today’s Glacier Park, are really “toy” glaciers, compared to those that carved those valleys out in the first place; and are a geologically recent addition to the area. Sing out if I misinterpreted that. The glaciers in GNP are much smaller than the ones that shaped the valleys. Even at their peak 150 years ago, they weren’t very big. Why begin at 1917 and exclude the previous years back to 1900 as you did in your latest “not a long term trend” link? 1917 is listed in the USGS article as the beginning of a hot and dry period with ice disappearing at a faster rate than at present. Again, the point of this article is to demonstrate that there is no evidence of a connection between CO2 and glaciers disappearing. By showing that similar episodes occurred in the past when CO2 is low, I am supporting my case. We do know that summer temperatures rose for a number of decades after the LIA, but that had nothing to do with CO2. Actually you have missed it entirely. The biggest knock against AGW has been about faulty process and propaganda. For example, pictures of polar bears on floating icebergs, receding glaciers, or calving ice sheets in Antarctica followed by cherry picked data sets and supporting graphs like the hockey stick. Right or wrong, I thought I saw that same questionable process here in this article. Doesn’t matter that I agree with Steve Goddard’s basic premise regarding causation. I have experienced the effects of a changing Montana climate for many decades. Some of the examples I discuss in previous comments. There are many more. When the charts don’t reflect that experiential reality, I call BS on those charts. Perhaps my stubbornness is a product of my Montana tempering where survival often depends on accepting a dynamic environment as it actually presents itself. Paper presentations and rhetorically arguments often miss that texturing that puts the lines in the faces of survivors. Now Casey, do you get that, Dude? Please tell us about your experiences in Montana during the period from 1917-1941, when snow pack was 30% of normal. Steve, I’ll have to take your word for it. Montana has captured some data and it is reflected here: http://nris.mt.gov/nrcs/snowater.asp See especially the Surface Water Supply Index. Years 92 thru 4/1 of this year. El Nino winters often bring the storm track south. Arizona and New Mexico have had a lot of snow, while Idaho and Montana have had little. The second photo linked, http://www.nps.gov/imr/pgallerycontent/p/l/20091222103746.jpg, in the article isn’t working anymore, it looks like the site with the image pulled it. Assuming the image is the same the file name shows up here (http://news.sciencemag.org/scienceinsider/2010/04/roundup-47-ice-nein-edition.html) with a picture of a mountain in Montana National Park: http://news.sciencemag.org/scienceinsider/assets/2010/04/07/20091222103746.jpg. In any even you’ll want to update your article with an appropriate image. Myles Allen: 1.5C Global Warming "will not feel like Armageddon"